The Blackpool Dance Festival just finished up in England! The biggest and most prestigious ballroom dance competition and event in the world. Each round starts from something like 200 couples. It would be awesome to attend one day, even if just to spectate. Some people I know have been able to spectate and/or dance there. Jealous. Here are some video highlights for your enjoyment! Obsessed. This is one of my favorite rumbas ever and it’s still so, so good, even 10+ years later. They were the best when they danced together. Note Arunas doing cha cha and being an overall goof. You never see this side of him! Also, Riccardo and Anastasia dancing standard. Michael and Joanna retire after their 8th Blackpool win! I appreciate them, but am a diehard Yulia and Riccardo fan. Also, Troels and Ina, WDC amateur Latin champions, went pro and made the finals for a couple of dances. Should be interesting to see how they do in pro! That standing spin thing that Maurizio and Andra did was sick. Also, literally everyone is wearing black or white or a neutral color. DSI London has graciously posted the first rounds from all the events on YouTube for free! If you have a lot of time to kill, check ’em out. There were tons of competitors from China and Japan this year. So it’s been a week, but I haven’t had any time to get my thoughts down on this competition/trip (grad school craziness). All-in-all, it was amazing!!! The worst parts were the two 10-ish-hour drives, but with friends, good music, and podcasts, it’s manageable. Just not something I want to do all the time. (Of course, I’m traveling to the DC area for the USA Dance Midatlantic NQE in three weekends, but never mind that…). Anyway. Staying in the competition hotel was a fantastic idea and now I totally understand why the pro-am folks almost always do that, even if they’re local. So, so convenient to just run up to your room to change or chill or whatever, rather than find a corner in a crowded ballroom to stash your stuff, have to change in a bathroom stall, etc. I wish that the MAC was in its traditional venue of Manhattan Center in Midtown, which has a nice regal feel to it, but the hotel was fine (other than the staff seeming to not give a crap about anything, but that’s a separate issue). Driving there was relatively easy. On Friday, I had absolutely no events to dance until Masters of Syllabus (MoS) Standard in the late afternoon/evening, and it was great, because I had severe lack of sleep. So I was just around, cheering people on, and trying to be generally helpful. We hadn’t practiced syllabus stuff almost at all prior to the comp, so MoS was a lot of lead-follow (which started out a little clunky) and trying to resist doing open moves. I didn’t feel like wearing one of my costumes, so just stuck with this purple syllabus outfit I have (made by Dance America, love it!) and some bling, which was an approach that one of my friends also took. I heard from her that someone from the judges’ area or thereabouts approved of our simpler approach, which is nice to know Mostly, I was just lazy and didn’t feel like dealing with all that volume/floatage. We got to the final out of a first round and ended up placing 5th, so clearly attire does not matter if it’s classy and your dancing speaks for itself. Woot! Similarly, the champ Latin winner had an unstoned black dress and just some classy stoned accessories, including this awesome ear cuff thing. Not that I’m that cool, just drawing a similarity there. 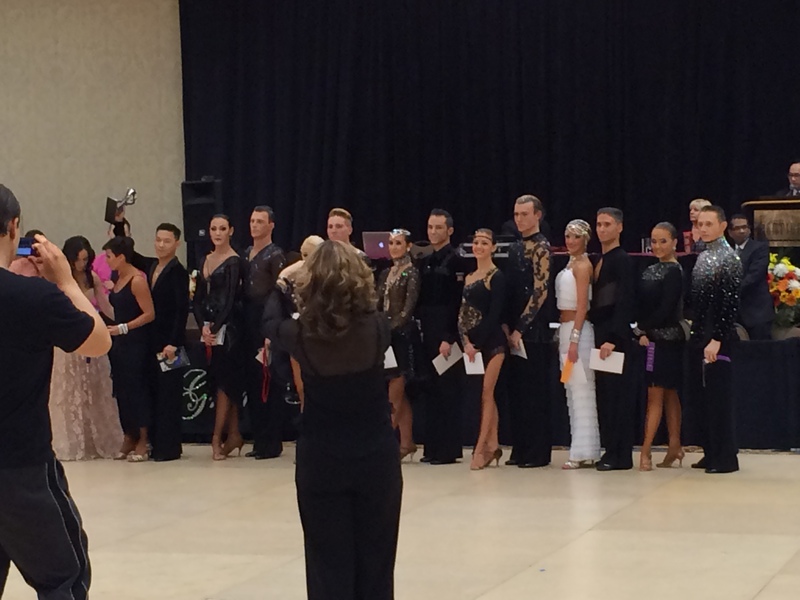 Interestingly, every single champ Latin finalist was wearing black or white. Mostly black. Saturday was full full full of dancing. I think I danced at least 50 individual dances in all. I was exhausted by the end of the day, but it was a really “on” day. Jesse and I made quarters for novice and prechamp standard, and missed the semi for novice by a single mark. Big improvement over last year’s MAC and woot, qualifying for Nationals. We also had our best round ever during the prechamp first round, and importantly made it through quickstep without effing it up! It’s a common issue. I now know a lot of people in these events, so that was really nice seeing good friends from undergrad and bumping into other ballroom friends (sometimes literally, on the floor). The BF (who hadn’t danced rhythm in five years) and I finaled in silver rhythm, and it was pretty fun. Then, smooth! Jesse and I finaled in prechamp from a quarter, and then danced champ. This was our first time really dancing champ smooth (last competition, we were the only couple), so we freaked out when we found out we had made the final from the semi of 12. I literally screamed a little, and if you know me, I am not a particularly excitable person (except when it comes to cute animals and food). I was close to dead from exhaustion by that point, and joked to Jesse that we could just stand there in the final and not dance, because we’d get 7th anyway. But we ended up placing 5th, which was, again, unexpected and fantastic. Mayo Alanen was generous enough to sponsor scholarships for those two smooth events, so that’s always a nice bonus. He seems super nice and I’d love to have a lesson with him at some point. The winners and many finalists (I think) are his students, so I think the money will just go back to him in some form, but it’s nice nonetheless. Saw some spectacular champ standard dancers, and the whole thing ended with some slightly controversial results. The winner was a couple with better dramatic, athletic, WDSF-style shaping, but worse floorcraft, while my (and many others’) favorites took second – they were more balanced, I think. The 2nd place guy looked familiar and his name rang a bell, so I thought he was one half of a youth 10-dance couple I had loved from a few years back. It turns out that he is that other guy’s brother! Ridiculously talented families, man. Sunday was a fun day in the city, watching the Broadway musical If/Then starring Idina Menzel from the 9th row (!!! ), eating lots of good food (highly recommend Cook Shop and Stanton Social Club), and doing a moderate amount of touristy walking around stuff in the cold rain. Overall, fantastic weekend, and I was sad to go back to my normal boring life. I was really happy with our dancing, but being the way I am, am always looking to improve. A few major things now – shaping/huge steps in standard, extending shapes and polishing transitions during smooth, and some posture stuff. Looking forward to a couple of lessons this week! Edited to Add: Also, so many of the Midwestern dancers who traveled to this competition killed it! I identify as more East Coast, but have come to adopt this area of the country. I think the East Coast has a better reputation for good dancers, but the Midwest people proved to everyone that there’s some fantastic dancing there as well :). Also! MAC has the best team match. Where else are you going to see Robotic Hustle and 3-person Argentine Tango? I’ve gotten lazy with posts, so here is some video inspiration from the amateur world championships. I LOVE Tania Kehlet, she is awesome (blonde in the white dress with black criss-crossing). WDSF-style standard is definitely very into extreme shapes, athleticism, unconventional styling, and pushing the current limits of the dance style. Sorry I haven’t posted much of anything here…I’m working on a post on ballroom crushes and have some ideas relating teaching a college course to teaching dance. They’ll be posted eventually when I have time to make them worth reading. On another note, I’m competing in Latin! I haven’t really done it other than with random partners for about a year, and finally, with the help of another ballroom friend, have convinced my main partner to do it again. Also am dancing gold Latin with another friend whose regular partner can’t make it, so that should be fun, too. Looking forward to watching the pro events and showdances. Here’s a taste of a few particularly good ones from past years, back when they aired it on PBS as America’s Ballroom Challenge. Standard’s changed quite a bit over the last few decades as well. My partner and I finally finished up our open standard tango routine (woot, all done with learning our standard routines now!) , so I figured I’d post this vintage take on it. The poofy short dresses are pretty amazing. I think it’s interesting how the frame is smaller and shapes are more upright/natural looking than today’s hyperstylized, athletic shaping. But the top dancers of today also seem more technical and precise, at least as far as I can tell. Here’s a more recent showdance from the Hiltons 15 years ago- more modern but still pretty different from today. Also, boa-feather skirt!